Tall teens should love and embrace their height, but sometimes long legs make it difficult to find pants in just the right length. As a tall girl, shop online for plenty of cute and trendy pant options. Just take a look below at some of my favorites. If you want more, I found a number of different stores that sell affordable and inexpensive fashions in long inseams that are just what you're looking for. You'll find a wide variety of popular styles including khakis, leggings, sweatpants, and dress pants, in a range of fashionable colors. With all these choices, you can finally have a pair of long inseam pants for every part of your day! TALL TIP: Alloy Apparel is a great place to start looking for inexpensive long inseam juniors pants. You'll get Free Shipping on orders over $95! Alloy Apparel ($) Inexpensive and cheap teen clothing store. Girls tall teens jeans and pants (casual, dressy, and active) in 35", 37", and 39" inseams. Also offers juniors tall dresses and skirts in extended lengths. Select the Tall Shop to view all tall clothes. Old Navy ($) Inexpensive and cheap teen clothing store. Tall teen girls juniors pants and jeans in long (34" inseam) and tall (36" inseam). Shop by inseam. Also has cute junior fashion tops, tees, tanks, dresses, skirts, shorts, jackets, and activewear in tall sizes. Girls plus sizes available. Shop online or at retail locations. EXPRESS ($$) Long jeans and pants with inseams of 35". In the Jeans and Pants categories, select your size from the drop-down menu. Shop online or at retail locations. Gap ($$) Variety of long size jeans and pants in up to 37" inseams with select styles in 38" inseams. Also offers popular styles of tops, tees, tanks, blouses, sweaters, dresses, skirts, coats, and jackets in tall sizes. Select the Women's Tall option to view all tall clothing. Shop online or at retail locations. Aeropostale ($) Tall girl pants and junior jeans in 34" inseams. Use "Shop by Size" feature in the Jeans category of the Bottoms section. Also has longer length tops. Shop online or at retail locations. American Eagle ($) Tall junior pants and jeans in long (34.5" to 35" inseam) and extra-long (36" inseam). Choose your length in the Sizes drop-down menu. Also has longer length juniors tops. Shop online or at retail locations. Buckle ($$) Teen clothing shop offering a selection of tall girls junior size jeans and pants in up to 37" inseams. Shop by inseam. Also has longer length tops. Shop online or at retail locations. Long Tall Sally ($$) Tall girl shop offering tall jeans and pants in 34" to 38" inseams. Also offers tall girls yoga pants, activewear, tops, sweaters, dresses, skirts, suits, coats, sleepwear, and swimwear. Extended sizes available. Shop online or at retail locations. Based in the U.K. Also in the U.S. and Canada. J.Crew ($$) Trendy tall size jeans and pants in 36" inseams with a select few in 35" inseams. 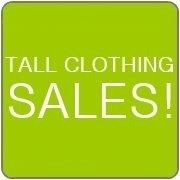 Also offers tops, jackets, suits, sleepwear, and swimwear in tall sizes. Select the Tall option under Special Sizes in Women's apparel. Shop online or at retail locations. Top Shop ($$) Trendy collections. Long length jeans in 36" inseams. Trousers and leggings in 35" inseams. Also carries girls tall clothing such as tops, dresses, skirts, and jackets. See the Tall section. Shop online or at retail locations. Based in the U.K.
New Look ($) Inexpensive and cheap junior clothing store. Tall girl pants and jeans in 35" inseams. Also offers girls tall clothing such as tops, dresses, skirts, and jackets. Select Tall under the Women's section. Shop online or at retail locations. Based in the U.K.
Next ($) Tall size juniors jeans, pants, and trousers in 35" inseams. Also carries tall girl tops, dress shirts, sweaters, dresses, skirts, jackets, businesswear, activewear, and sleepwear. Select Tall under the Women's section. Based in the U.K.